For the modern horticulturist, hellebores have a particular place in the English garden. Early flowering and tolerant of shade, their sorrowful, pendulous flower heads bring hope to us all that winter is finally broken. Look back through the centuries however and you’ll find that ‘hope’ would not have been a word associated with the hellebore family, and for reasons more sinister than you would imagine. 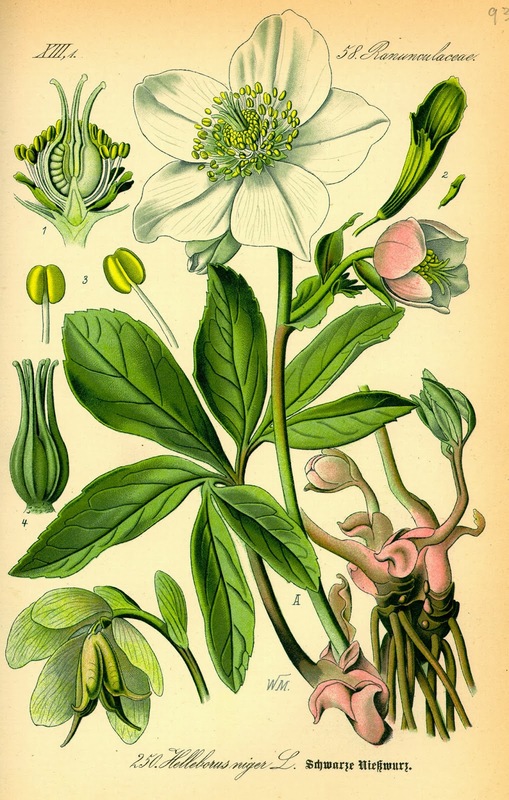 Travel back through time and you will find that many of the ancient civilisations have used hellebore as a medicine. Traditionally used as a cure for paralysis, gout, and insanity, many species within the hellebore family are in fact highly toxic causing symptoms such as vertigo, swelling of the tongue and throat, tinnitus, and thirst. In extreme cases it can lead to slowing of the heart, heart attacks, stupor, and even death! 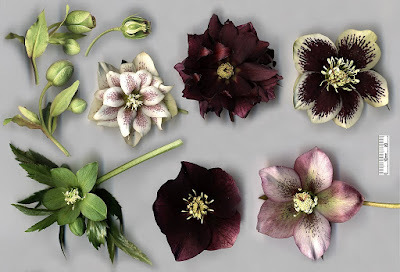 It’s these darker qualities that the hellebore possesses which have, over the years, helped to cloak it in a number of dark myths and folklore. Perhaps most recent is its association with witchcraft and its use in summoning demons. It is the ancient Greeks who seemed to get the most out of it. During the Siege of Kirrha in 585 BC the Greek forces poisoned the city’s water supply by adding copious amounts of crushed hellebore leaves to it. None the wiser, the besieged inhabitants drank the tampered water and were quickly overcome with severe diarrhoea. No longer able to defend the city, the Greeks mounted an aggressive attack, quickly securing the city for themselves. Perhaps the most insidious use of hellebore is in the death of Alexander the Great. He was in Babylon at the time and was already taking medication administered by his royal cup bearer Iollas, a position that required the utmost trust. Having created many powerful enemies through his conquests of the Mediterranean and North Africa, it was only a matter of time before an assassination attempt was made. This turned out to be an inside job arranged and executed by top Greek politicians. Using the son of Alexander's Greek Viceroy as a ‘mule’, hellebore was brought into Babylon, cleverly hidden inside a mules hoof. It was later administered by the royal cupbearer in a dreadful betrayal of his position. Twelve days later and Alexander was dead from an overdose of hellebore. There are also stories of the great Hippocrates using hellebore as a purgative although the actual plant used is believed to be the white hellebore, also known as Veratrum album or False Hellebore. Nevertheless, this plant is also highly toxic containing the poisons jervine, cyclopamine and veratrine. However there is however one story in Greek Mythology where Hellebore has been given a positive message. It was used to cure the daughters of King Midas after they were touched by madness and found running naked through the streets screaming. Believed to have been given the madness by the god Dionysus, it was the quick thinking actions off Melampus of Pylos who, after administering a potion of hellebore, managed to save both the daughters and the day. There is one more rather charming story that is derived from the Helleborus nigra, a plant which is more commonly known as the Christmas rose. Tradition says that the Christmas rose received its name after growing from the tears of a young Jewish girl. The reason why she was so sad was because she was too poor to have a gift to give the baby Jesus, as was the custom in her day. The rest of that story, as they say, is history. Main image credit Original book source: Prof. Dr. Otto Wilhelm Thomé Flora von Deutschland, Österreich und der Schweiz 1885, Gera, Germany. Public domain.